Due to the seasonal nature of our business we regret that refunds can not be made later than 60 days before your arrival. Prior to 60 days refunds will be made less an administration fee of $100 weekly or $40 nightly. In summer season (July 2-Aug 27 2016) we rent our cottages for a weekly minimum from Saturday to Saturday. **The exceptions are the cottages 4eeee's and Restinup which are rented at a two day minimum during the high season. Long weekends cottages will be rented for a three day minimum. Reservations: A confirmation letter will be mailed/emailed when we receive your deposit. Usually within 24hrs. Deposits: 35% of total rate. Balance collected on arrival. Refunds: Refunds cannot be made later than 60 days before your arrival. If cancellation occurs within 60 days of arrival deposits will not be refunded. Prior to 60 days refunds will be made less an administration fee of $100 weekly or $40 nightly. Extra Guests: The maximum number of people is indicated on our booking calendar. Extra guests may be accepted at $15 per person per night subject to our approval. Pets: We welcome most pets provided you let us know in advance. There will be a $10 per night or $50 per week charge per pet. Pets must be kept quiet, kept on a lead and not allowed on at the beach or playground. Check-in time is 4PM, check-out is 10 AM. Smoking: We ask guest to smoke on their deck or screened porch and not in the cottage. Boats/Docking: Renters are charged only for the amount of gas they use. Weekly cottage guests receive a 10% discount on all marina rates, except gas. General: Linens, dishes and kitchen utensils are supplied with each cottage. To keep the environmental impact down in the busy summer months we appreciate guests bringing their own towels. Payments: Visa, Master Card, Amex accepted online. Debit machine available at front desk on arrival. Traveling with minors: We are a family resort. Guests must be 18 and over unless accompanied by an adult. Birch Cliff Lodge was established over seventy years ago and today it is one of Ontario's most picturesque cottage resorts. The cottages retain much of their original charm but have now been modernized and upgraded with thermostatically controlled heating and modern, four piece bathrooms with lots of hot water. The kitchens have full size refrigerators and stoves and are stocked with dishes, cutlery and cooking utensils. Each cottage has either a screened porch or an open deck with a table and chairs. Linens are supplied. Upon arriving at Birch Cliff you will find your cottage clean and well aired. There will be enough coffee, tea, sugar, salt, pepper, soap and cleaning supplies to get you started. If you have any special requests please don't hesitate to let us know. The cottages and main lodge face southwest, overlooking Baptiste Lake. It is an open, breezy location with a natural sand beach. Tall birches provide shade on warm summer days. 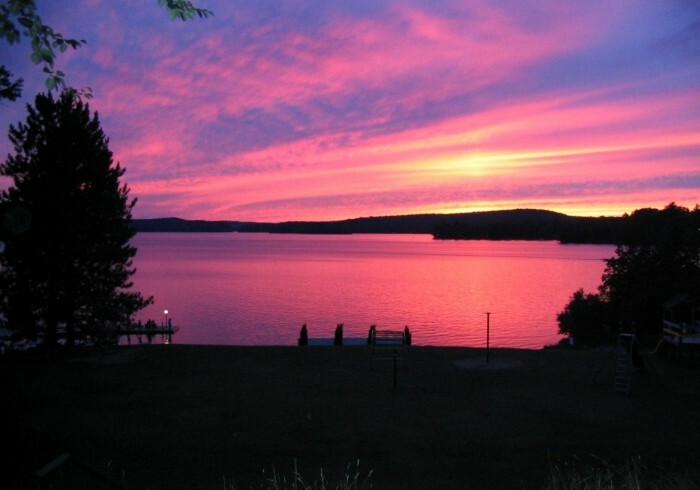 Magnificent sunsets reflect across the lake bringing the day to a memorable close.The Baptiste Lake system is one of the prettiest in Ontario. Set in the high, granite hills of North Hastings and Haliburton, Baptiste has long been a favourite of painters, photographers and nature lovers. Birch Cliff offers a variety of recreational activities. In the summer our children's program director organizes hikes, games, crafts, campfires and a weekly Monte Carlo night. There is a fully equipped playground, a horseshoe pit and a ping pong table as well as badminton and volleyball courts. Our clean, sandy beach is weed free and enters the water on a gradual slope, making it safe for youngsters. We also rent canoes, motorboats and pedal boats. We have dock space available for guests who wish to bring their own boats.